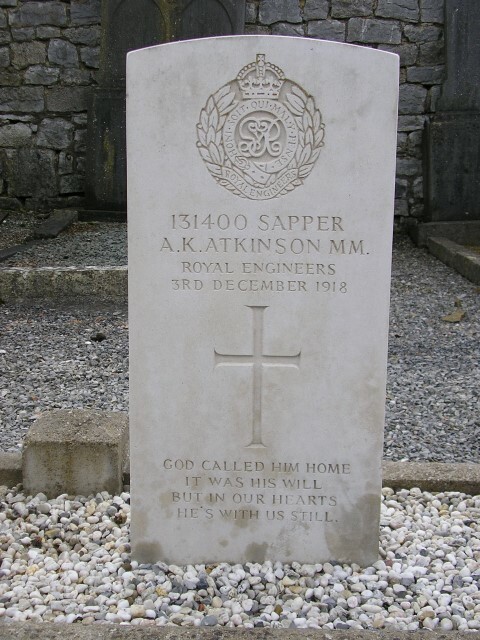 131400 Sapper Arthur Kenneth Atkinson, M.M., 206th Field Company, Royal Engineers was killed in action 3 December 1918 and is buried at Soumoy Communal Cemetery, Belgium. He was 22 years old and is commemorated on the Evenwood War Memorial and the Roll of Honour, St. Paul’s Church, Evenwood. Again in October 1918 but the exact date cannot be deciphered. Sapper A.K. Atkinson was awarded the Military Medal. Details remain unknown, further research is required. The Military Medal was instituted in 1916 and awarded to non-commissioned ranks of the Army, Royal Flying Corps and Royal Naval Division for acts of bravery against the enemy. Some 115,600 Military Medals were awarded during the First World War with 5,796 bars, 180 second bars and 1 third bar. After 1913, the Military Medal was replaced with the Military Cross which was opened to all ranks. Sapper A.K. Atkinson was awarded the British War and Victory medals and the Military Medal. Sapper William Cuthbert McCarthy M.M. aged 23 from Jarrow, Co. Durham. Sapper Arthur Kenneth Atkinson M.M. aged 22. Sapper A.K. Atkinson, M.M. is commemorated on the Evenwood War Memorial and the Roll of Honour, St. Paul’s Church, Evenwood.